Melanin is a very widespread, natural pigment found in the animal kingdom. Different forms of melanin are responsible for the colour of organisms, the black and the brown/reddish hues, for example. Over the last few years, studies have attempted to identify evidence of melanosomes (the specialised part of the animal cell which synthesises, stores and transports the pigment), within the fossil record, but why is the search for an understanding about the colour of long dead creatures so important? In living animals today, colour patterns are closely linked to behaviours and colouration provides information on how these creatures interact with their environments. From the ornate and beautiful peacock to the striking pigmentation of an okapi, knowledge of the colour of an organism provides scientists with a host of information. If only we had such insights for long extinct animals, well we do, but the identification of preserved melanosomes in the fossil record has proved controversial. The interpretation of the structures found has led to some very colourful debates. Are scientists able to infer pigmentation from these preserved remains? Even the Dinosauria has been dragged into the discussion, back in 2010, Everything Dinosaur reported on research led by Bristol University that attempted to identify the colour of feathers preserved in the fossils of a little Chinese Theropod dinosaur Sinosauropteryx. Now a new paper produced by scientists from the University of Bristol in collaboration with colleagues from Virginia Tech and a number of other American academic institutes, backs the earlier research suggesting that the chemical preservation of melanin is possible within the fossil record. The scientists studied a range of exceptionally well-preserved vertebrate fossils including specimens dating back to the Carboniferous and much more recent fossil material, the bats from the Early Tertiary shales of Messel in Germany, for example, along with some even more recent Miocene fossils. The team were able to show that melanin is preserved in a number of soft-bodied fossils, but its burial under high pressure and temperature, all part of the fossilisation process does alter its original chemistry. Other scientists had proposed that the structures thought to be melanosomes preserved in the fossil record, were actually bacteria that had become part of the fossil structure as they preserved the bacterial action of the original organic remains decomposition. The research team concludes that the relatively widespread occurrence of melanin found allows them to dismiss the suggestion that these structures are microbial in origin. Dr. Jakob Vinther (Bristol University), one of the authors of the paper published in the PNAS (Proceedings of the National Academy of Sciences – America), replicated the conditions under which fossils form and then subjected the samples to analysis using extremely sensitive ion mass spectroscopy (TOF-SIMS – time-of-flight ion mass spectroscopy), the scientists were able to map how the melanin chemical composition would change over time and then compared their results to what was found in a chemical analysis of the fossil record. In short, if scientists now know how the pigment behaves during fossilisation and what its chemical signature should be after the fossilisation process has occurred, then they should be able to identify melanin in fossils by looking for this tell-tale signature. There are two distinct types of melanin, eumelanin is responsible for the colour black and these structures resemble tiny sausage shapes when examined under high magnification. The second type, responsible for the reddish/brown hues is phaeomelanin and its structures look much more circular when viewed under a microscope. Importantly, structures which resemble these shapes have been spotted in the fossil record, as they have different chemical signatures, a chemical analysis can be used to back up observations regarding observed melanin structures. Take for example, those prehistoric bat fossils from the Messel shales which date from the Eocene Epoch. Two species were studied and microscopic analysis of the beautifully preserved fur showed shapes that looked like the more circular structures associated with phaeomelanin (reds and browns). The time-of-flight ion mass spectroscopy confirmed this interpretation. Chemical signatures found support the idea that those circular structures would have meant that when these bats lived some fifty million years ago, the bats would have been reddish-brown in colour. By using the morphological analysis backed up by the chemical signature study, the team could conclude with a high degree of certainly that these two species of bat were effectively brunettes. Reddish/brown bats of the Eocene. Also involved in this study were scientists from the University of Texas at Austin (Texas), along with Caitlin Colleary, who had done his Masters Degree at Bristol University but was now a PhD student at Virginia Tech. This area of research is likely to remain controversial for a while longer. So much depends on how we interpret the morphology of these tiny structures. This research does provide a chemical method of helping to back up findings, however, we suspect that the debate amongst scientists will rumble on. After all, in scientific research of this nature, hardly anything is as clear as black and white. Dinosaurs may have laid coloured eggs (May 2015): Did Dinosaurs Lay Coloured Eggs? More fossils of the very first Cretaceous dinosaur to be described from Australia have been excavated over the winter months and scientists could be on the verge of solving a mystery surrounding whether the Titanosaur named Austrosaurus mckillopi deserves to be a valid genus or not. The winter months (southern hemisphere), are the best months to conduct field work in Queensland (Australia), although still hot, the daytime temperatures are nowhere near as high as they are in the summer and the months of June through to the early part of September are regarded as the season of field work when volunteers join palaeontologists on organised digs, excavating the rich Mesozoic fossil heritage of this Australian State. Austrosaurus means (southern lizard), scientists have estimated that this dinosaur may have reached lengths in excess of fifteen metres. Fieldworkers at the site, the original wooden posts marking the 1932 discovery can be seen in the picture. Back in 1932, a farm worker found some fragments of bone that turned out to be vertebrae from a huge Titanosaur. The fossils were very unusual as the location of the fossil find – Clutha Station close to the settlement of Richmond had provided scientists with some excellent examples of marine reptiles. The sediments deposited in this area represented a marine environment, however, the carcase of a large, herbivorous dinosaur had been washed out to sea and the fossils had been exposed on the surface due to erosion. Sadly, the fossil location was lost and although a dinosaur was named based on the fragmentary remains (Austrosaurus), no further material could be recovered. That was until last year, when the mayor of Richmond John Wharton set out to search the Clutha Station area in a bid to re-discover the fossil site. Searching by truck did not prove successful, but when a helicopter was hired, two wooden posts in the ground were soon spotted from the air and on further inspection this proved to be the site of the 1932 fossil discovery. A preliminary investigation led to a full-scale excavation taking place during this year’s field work season. A number of pinkish-white bones were excavated, including some very well preserved rib bones, the largest of which measure 1.6 metres in length. These bones are very likely part of the same skeleton as the vertebrae discovered in 1932. The bones are currently on display at the Kronosaurus Korner museum in Richmond. Further preparation and cleaning will be undertaken and then an analysis carried out comparing this, now more complete skeleton to the fossilised remains of Wintonotitan wattsi, another Australian Titanosaur, whose fossils have been recovered from rocks of a similar age, but the majority of these fossil finds have taken place to the south of the town of Richmond (near to Winton). Hard at work excavating the fossil remains. Attempts had been made in the 1970’s and 1980’s to relocate the original Austrosaurus dig site, but they had all been unsuccessful. Thanks to the dedicated folk of Richmond and the surrounding area, Australian scientists have the opportunity to learn more about the first Cretaceous dinosaur to be described in Australia and to find out whether Wintonotitan and Austrosaurus deserve to be separate genera. A scale drawing of Austrosaurus. In January, Everything Dinosaur predicted that this year would be an important one for Australian dinosaur discoveries. There have been a number of fantastic fossil finds and it is great to hear the 1932 fossil site has been rediscovered. Showing off a fossil rib. Everything Dinosaur has received reports that scientists from the Museum of the Rockies (Bozeman, Montana), may have discovered a new species of horned dinosaur (Ceratopsidae family). The fossils including elements of the skull were originally found during fieldwork on the Judith River Formation back in 2012, but it was not until this week that researchers realised that the bones could represent a new species of horned dinosaur. The Judith River Formation, part of the Judith River Group, is famous for its vertebrate fossils and a number of dinosaur genera have been described from the various sub-divisions that make up the Judith River Formation, although, as far as we at Everything Dinosaur there has never been any Sauropod fossils associated with this particular geological feature. Numerous Ornithischian and Theropod dinosaur fossils have been found, although a number of genera that have been named are based on very fragmentary remains, a consequence of this part of Montana being first explored during the “Bone Wars” of the late 19th Century by scientists such as Edward Drinker Cope. More research is required to identify this fossil find as a new dinosaur. As the fossils, which represent about eighty-five percent of one individual, were found very close to the Careless Creek Ranch site where the first fossilised remains of the small horned dinosaur known as Avaceratops (A. lammersi), were discovered back in 1981, it was thought that the bones represented another specimen of Avaceratops. However, as researchers from the Museum of the Rockies removed the fossils from their protective plaster and burlap jackets it was noted that the skull morphology was somewhat distinctive and different from that seen in the Avaceratops holotype. In addition, this specimen seemed to lack a nasal horn. This data has led the researchers to speculate that this could be a brand new species of horned dinosaur. A scale drawing of Avaceratops. If the fossil represents a new species then it can possibly help palaeontologists to learn more about the radiation of the Ceratopsidae that took place during the Early to Middle Campanian faunal stage (around 79 to 77 million years ago). If the fossils turn out to be another example of an Avaceratops, than ironically they could have a far greater significance. The relationship between Avaceratops and other members of the horned dinosaur family tree is not clear (phylogeny). Avaceratops is regarded as a basal member of the Centrosaurine dinosaurs, but this position has been debated. In addition, the actual size of this dinosaur remains uncertain. The holotype material has been regarded as representing a sub-adult, even a juvenile specimen. In Everything Dinosaur’s illustration we show Avaceratops as being relatively small for a Late Cretaceous member of the Ceratopsidae. However, other researchers who have looked at more recent fossil finds suggest that this dinosaur could have reached lengths of over four metres and weighed in excess of one tonne. If these new fossils do indeed represent another Avaceratops, then with eighty-five percent of the skeleton to study, palaeontologists might learn a lot more about how Avaceratops grew and where it fits into the horned dinosaur family. Avaceratops has been very much one of Everything Dinosaur’s “dinosaurs of the week” this week. During a school visit, we met a young girl called Ava and we explained all about the dinosaur that shares her name. We even sent over a picture of Avaceratops so the class could see what we think this dinosaur looked like. Avaceratops was named after Ava Cole, the wife of Eddie Cole who found the first fossils of this herbivorous dinosaur. Scientists have announced a new species of duck-billed dinosaur that once roamed the polar forests of Alaska. The dinosaur, named Ugrunaaluk kuukpikensis pronounced 00-grew-na-luck kook-pik-en-sis, reached lengths in excess of nine metres and its discovery further supports the theory that during the Late Cretaceous, Alaska supported a unique dinosaur fauna. Duck-billed dinosaur would have seen the northern lights. The fossils, which include the remains of a number of individuals, came from the Liscomb Bone Bed, a highly fossiliferous layer of rock along the Colville River in the Prince Creek Formation. These rocks consist of flood plain deposits and shed light on life in the far north of the American continent some 69 million years ago (Maastrichtian faunal stage). The Colville River area has produced evidence of a number of dinosaur species that suggest that the wildlife existing at the very top of the landmass known as Laramidia at the end of the Age of Dinosaurs was not found anywhere else in the world. Recent fossil finds include teeth of giant Troodontids and a polar Tyrannosaur. Earth sciences curator at the University of Alaska Museum of the North, Dr. Druckenmiller worked with University of Alaska Fairbanks graduate student Hirotsugu Mori and Florida State University’s Gregory Erickson in order to piece together the fossilised and disarticulated remains. However, the naming of this dinosaur involved Ronald Brower Senior, an expert on Alaskan native peoples. The scientists wanted to give their new dinosaur a name that honoured the Iñupiaq people who live along the Colville River. Mr Brower, a teacher at the University of Alaska Fairbanks Alaska Native Language Centre and an expert on the culture and history of the Iñupiaq, helped the team come up with Ugrunaaluk kuukpikensis, the name translates as “ancient grazer”, a reference to the extensive dental battery these dinosaurs possessed, vital if they were able to cope with a diet of coarse pine needles, fir cones and ferns. Although the Arctic is much colder today than it was back in the Late Cretaceous, these dinosaurs, if they had been permanent residents*, would have endured many months of complete darkness and an average annual temperature of around nine degrees, that’s about the equivalent annual average temperature of Toronto (Ontario, Canada) today. These substantial herbivores would have been well used to seeing snow and ice. The research team had to endure a lot of extreme weather including snow falls. This is the fourth unique dinosaur species to be identified from this part of the world. The researchers propose that these dinosaurs were specially adapted to survive the harsh climate and that northern Laramidia supported a unique ecosystem. The absence of any crocodile, lizard or turtle bones from the deposit suggests that ectotherms (cold-blooded reptiles) could not cope with the cold at this latitude. *As to whether these duck-billed dinosaurs were residents or seasonal migrants has caused some debate amongst palaeontologists. Some scientists have proposed that these large herbivores migrated up to these latitudes so that they could take advantage of the abundant plant growth in the summer months, when there would have been almost permanent daylight. However, Greg Erickson believes that the young Hadrosaurs found at the site were too small to be able to undertake such an extremely long migration. He thinks that the dinosaurs were permanent residents. The Florida State University scientist explained these dinosaurs may have had physiologies more like birds or mammals. The researchers hope to study the fossils in more detail so that they can understand more about how such large reptiles were able to survive so far north. As to where Ugrunaaluk kuukpikensis fits into the Hadrosaur family tree, the dinosaur resembles an Edmontosaurus, but it was ascribed its own genus based on differences in the anatomy of the skull and differences in the morphology of some of the other post cranial fossil material. What Role in Ecosystems did Giant Azhdarchid Pterosaurs Have? Ask a young dinosaur fan to name a flying reptile and in all likelihood they will come out with the name of one of the really large Late Cretaceous Pterosaurs. Pteranodon will probably feature (member of the Pteranodontia), which once boasted as many as eleven species in this genus, but now most palaeontologists except the revision down to just two (P. sternbergi and the geologically younger P. longiceps). However, matching Pteranodon in popularity and exceeding it in terms of wingspan come the likes of Hatzegopteryx and Quetzalcoatlus. These two flying reptiles are representatives of the enigmatic Azhdarchidae and as such could be regarded as the most spectacular of all the flying reptiles known to science. 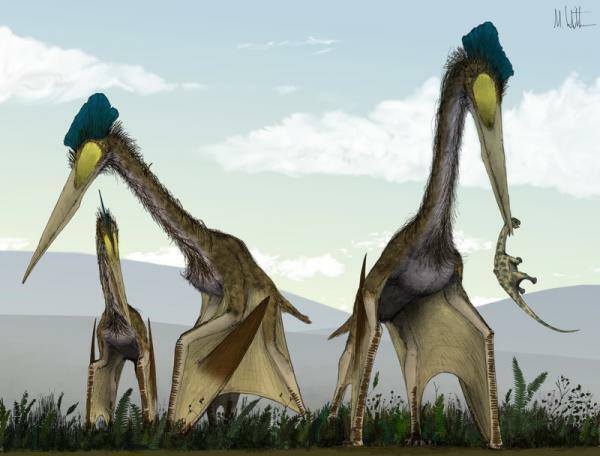 There is no doubting some of these azhdarchid Pterosaurs were giants, Hatzegopteryx (H. thambema), for example, was taller than a giraffe and its wingspan could have exceeded twelve metres. Quetzalcoatlus from Upper Cretaceous sediments of Texas, is believed to have been even bigger. When the huge skull is considered, one of the largest known in the Tetrapods (excluding marine animals such as the Cetaceans), when the robust post cranial fossil material associated with Hatzegopteryx is examined closely, it seems incredible that these large creatures were able to take to the air. However, when the global distribution of the fossils is considered along with aerodynamic wing shape studies, it seems that most of the Azhdarchidae were indeed accomplished fliers. This begs the question, what role in the Late Cretaceous ecosystem did these toothless giants have? There have been a number of research papers published exploring this area of Pterosaur research. Recently, Mark Witton, a leading expert on the Pterosauria (University of Portsmouth) collaborated with Darren Naish (University of Southampton) to produce an intriguing paper in the latest edition of the quarterly journal “Acta Palaeontologica Polonica” on this very subject. Both these eminent British scientists have written extensively on the Pterosauria before, but in this new paper entitled “Azhdarchid Pterosaurs: Water-trawling Pelican Mimics or “Terrestrial Stalkers”?”, they conclude that large azhdarchid Pterosaurs were very probably terrestrial hunters, perhaps filling a role in ecosystems similar to that of the Maribou Stork (Leptoptilos crumenifer) today. These storks are large wading birds and are widespread in sub-Saharan Africa. They have a reputation for eating almost anything that can fit into the mouths including rubbish from garbage dumps. They do feed on carrion and it has been proposed that azhdarchid Pterosaurs were scavengers too, but these heavy birds also stalk and feed upon a variety of small vertebrates such as frogs, lizards, other birds and small mammals. In this new paper, Mark and Darren examine the evidence for these claims and conclude that the fossil evidence does indeed support the idea that these large animals were indeed terrestrial foragers. Firstly, the fact that fossils of azhdarchids are found in strata that represent lacustrine, riverine or marine environments is dismissed as having no real significance with regards to the behaviour of these flying reptiles. Water transport and deposition accounts for a huge proportion of the vertebrate fossil record and therefore, the deposition in aquatic deposits probably has no bearing on the actual lifestyles of these creatures. Secondly, it is true, that pelicans are very efficient feeders and their pouches do help them forage, but an examination of the joint function of Pterosaur jaws indicates that they are entirely different to those of the jaws of pelicans. Pelican beaks are highly specialised compared to those of all other Tetrapods, studies of azhdarchid jaw (albeit from very crushed remains in most cases), fossils, suggest that these Pterosaur jaws are anatomically very different from those of pelicans. The researchers cannot find any strong evidence to support the idea that azhdarchids foraged like pelicans. Some Pterosaurs were as tall as a giraffe. In addition, the estimated amount of jaw expansion present in azhdarchids was proportionately much smaller when compared to that of pelicans, even when the asymmetrical jaw joints of azhdarchids are considered. Lots of other reptiles from the fossil record also show evidence of asymmetrical jaw joints, yet there is no evidence to suggest that these creatures too, indulged in pelican-like feeding behaviour. Finally, the researchers refute the idea of these Pterosaurs being particularly prone to attack once on the ground. Trace fossils indicate that Pterosaurs were quite capable walkers on land and although encumbered by their wings, they were not completely helpless. There are lots of birds around today that adopt a terrestrial foraging strategy, the risks to stalking Pterosaurs from a large Theropod attack are probably overstated. For example, studies of Pterosaur take-offs indicate that these creatures could probably take to the air quite quickly and when you consider that they would have had a pair of sharp eyes perched some five metres off the ground, the likelihood of a meat-eating dinosaur ambushing them would have been considerably reduced. So, after a careful examination of the available evidence, the researchers conclude that terrestrial foraging for the likes of Hatzegopteryx remains the most likely feeding strategy. This gives a whole new meaning to the idea of “picking something up for dinner”. Back in 2013, Mark P. Witton wrote a fantastic book all about the Pterosauria, it was called “Pterosaurs, Natural History, Evolution, Anatomy” and it is well worth purchasing. Everything Dinosaur’s teaching work in schools continues to impress teachers and teaching assistants and the company has achieved a top rating of five stars for its school visits. Feedback forms received average five stars, the highest mark available on Everything Dinosaur’s rating system. After a dinosaur workshop we ask the teaching team to provide feedback on our performance, how we engaged the children, the way in which we adjusted our work to meet the learning needs of the class and how we were able to assist the teachers in helping them to achieve their lesson outcomes. Our efforts in these areas have resulted in Everything Dinosaur’s workshops in schools getting a top rating. Top marks for dinosaur company. The average rating is calculated by software embedded in the company’s specialist teaching website. This information is then displayed on the front of Everything Dinosaur’s feedback/rating page. In this way, any prospective customer can see instantly how our workshops are rated. There are also pages and pages of teaching reviews available, all written by teaching professions, senior leadership team (SLT) members or teaching assistants who have experienced one of our workshops first hand. Great feedback for Everything Dinosaur’s teaching work in schools. We ask the teacher to rate our work and to write comments regarding our performance. Sometimes, as in the picture above we even get a smiley face from the feedback provider. Top marks from teachers from Everything Dinosaur. Such feedback is very important to us, it allows our team members to consider and take on advice and constructive comments so that they can make their teaching work in schools even more effective. With the roll out of the new curriculum in England, with its emphasis on scientific enquiry and scientific working our visits to schools are becoming increasingly popular, especially when you consider that rocks and fossils are teaching elements in the science curriculum for Lower Key Stage 2 and the Year six students are expected to know something about adaptation, extinction, inheritance and natural selection. For Everything Dinosaur, our teaching about dinosaurs in schools continues to attract top marks from teachers.